Tazmanian Devil "Taz" is an outstanding young prospect!! [Credit: Kim Hastings] Taz is a Wolf Patterned (Aguoti)Border Collie. 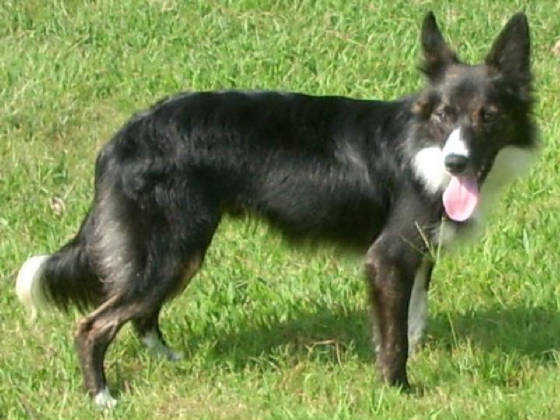 His markings and colorations are not seen very often in the breed but are linked back to Don ABCA # 73710. [End Credit: Kim Hastings] He is from two of my favorite dogs on the farm. He is sharp as a tack and learns things very quickly! He is a total natural on stock. With his father's style and mother's down -- he makes one killer working dog. The freshly started dog has great eye, but he's not afraid to bite. Works well with handler and minds very well. Also started learning basic obedience and picked every thing up in less than 5 minutes. He is solid on heel with a loose lead, sits well, downs on a dime, and has a good stay. 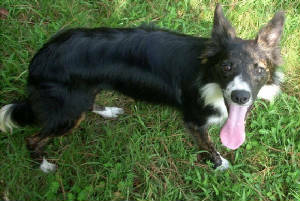 He is also a champ at his "Here" command; which will help in future herding training when he is trained to "look back". Taz has a promising future not only as a stud in our kennel, but a performance competetion dog. But for now he is in training and learning everything we throw at him. He is a great dog and a joy to own! !